A certain badass mofo will be making his debut on Cartoon Network a bit sooner than expected. 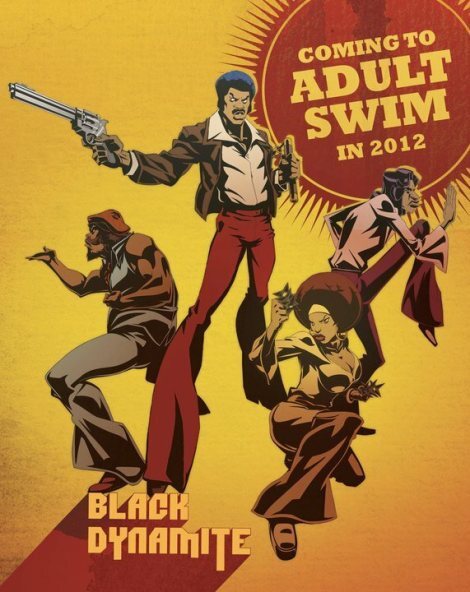 The pilot episode for Black Dynamite: The Animated series was screened at the San Diego Comic-Con during a panel hosted by Michael Jai White, Carl Jones, Scott Sanders, and Kim Whitley. Those of us who didn’t attend will have to make due with this teaser trailer until the pilot airs exclusively on Adultswim.com on August 8th. A two week waiting period isn’t an ungodly amount of time, but it’s not every day that a cartoon series featuring a black protagonist makes its debut. The quality of the animation seems about on par with the third season of The Boondocks, which is good or bad depending on how one feels about that show. The style on display is trippy, like being sucked into one of those classic Parliament Funkadelic album covers by Pedro Bell. Play close attention and you will see Black Dynamite and crew doing battle with what look like a parody of Jim Henson’s Muppets characters. It seems that the creators of the series are taking full advantage of the considerable leeway allowed them as part of Adult Swim. That’s a good thing, as any semblance of restraint on a show like this would be a bad omen indeed. What are you waiting for? Press play and behold the insanity!